A dose of Mother’s Day murder and a quiz night are the latest special events to take place at the Limelight Theatre to raise funds for Queens Park Arts Centre. Taking place on Mother’s Day, on Sunday (March 26), and devised and performed by an experienced team of local theatre makers, Murder by Matrimony will include a brand new murder mystery play written by Karen Banfield. In 1937 two families will benefit if they are joined together by matrimony. But despite everyone’s efforts to keep their secrets hidden before the wedding, enough is said to cause someone to commit murder, writes Heather Jan Brunt. Once the first half of the play is over the audience will have a chance to go through the clues and decide whodunnit, submitting their guesses as to who the murderer is and what their motive was. Audience members are encouraged to sign up in teams and work together to figure out the answer,and there will be a small prize for the winning team who guess the correct culprit. Tickets cost £10 and concessions are £8. Meanwhile, from 8pm on Saturday April 22 the centre will host its latest Quiz Night led by Faye Law and Grace Hudson. Teams of no more than six are welcome, but places must be booked before Tuesday April 18. Rounds will include pictures and music. Both of these events will raise money for the centre’s ongoing campaign to improve the site and its facilities for the tens of thousands of people who visit and benefit from it every year. 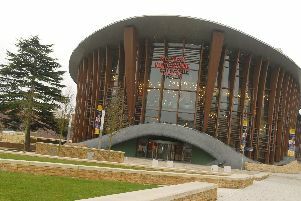 Both fund raising events at the centre in Aylesbury can be booked online at www.qpc.org or call the box office on 01296 424332.